The commercial nuclear power sector has evolved with great help from the military-industrial complex. Research and development funded for the purpose of national defense has resulted in advances directly applicable to the power industry. For molten salt reactor designs to succeed, political support and military dollars may again be necessary. Observers of the energy sector have likely noticed a growing interest worldwide in small modular molten salt reactor (MSR) concepts. North American companies such as Terrestrial Energy, Southern Company, and TerraPower are working to industrialize designs (Figure 1), while the Shanghai Institute of Applied Physics recently received $3.3 billion from the Chinese central government to build an MSR complex in the Gobi Desert. In the 1950s, thanks to the development of the pressurized water reactor (PWR), the U.S. Navy achieved a military grail: unlimited endurance at sea. It completely changed naval warfare, as the U.S.’s nuclear-powered vessels could sustain operations almost limitlessly, while enemy defenses were left coping with the burden of fuel oil restrictions. PWR systems were endorsed for naval propulsion over other designs for various reasons. Despite the fact that PWR technology requires high pressure, thus provoking high-energy releases in the case of pipe breaks, several features made it suitable for ships. It has a negative void coefficient when under-moderated, making it auto-stable to power variation demands and loss of coolant scenarios, among other things. In the beginning, the U.S. Navy also tested sodium-cooled reactors (USS Seawolf), but it faced many difficulties with the design, resulting in the cancellation of the program and the exclusive use of the PWR as the steam-maker for U.S. Navy nuclear ships. It was a remarkable feat when the first-ever PWR powered submarine—the USS Nautilus—went underway on nuclear power in January 1955, less than 10 years after World War II ended. The path to industrialization was also quite fast. 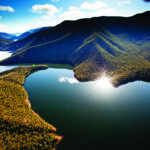 Water is, of course, a well-known fluid in the PWR operating domain and engineering solutions to control it have existed since the beginning of the industrial revolution. Besides, as water is also the fluid used to run the turbine, a leakage between primary and secondary fluids could be addressed in a simple way. What may not be as widely known is that the U.S. Air Force pursued the same goal as the U.S. Navy and almost reached it. 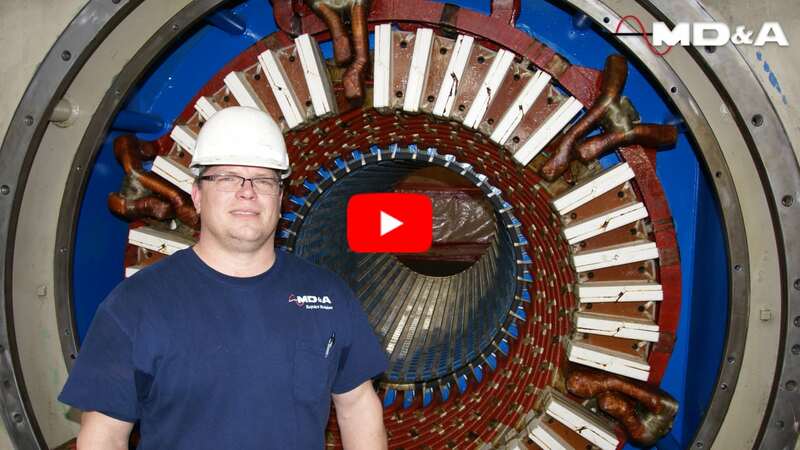 Just after World War II, the aircraft nuclear propulsion program was launched, and it resulted in the prototyping of several MSR reactors at the Oak Ridge National Laboratory with promising results. The MSR design was chosen over PWR technology because turbojet engines and ramjets need an energy source able to deliver heat of at least 800C, far above the capabilities of PWRs. Indeed, as the name indicates, MSRs use a molten fluoride salt mixture as the primary coolant, which has the property of staying liquid at atmospheric pressure at temperatures up to 1,500C. For comparison, PWR coolant in liquid phase requires pressure of more than 150 bar while delivering temperatures of only 300C. 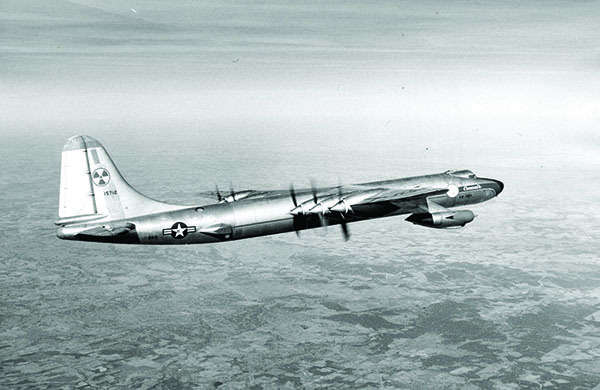 While the aircraft nuclear propulsion program itself was technically very challenging with many difficulties to overcome, such as the weight/thrust ratio of the system, the radiation protection for the crew, and the environmental impact in case of crash, it went pretty far, with several tests performed with a nuclear reactor operating onboard a modified Convair strategic bomber (Figure 2), while a 2.5-MWth land-based MSR was tested in Oak Ridge. However, after more than $1 billion spent without any operational nuclear bomber able to fly, and engaged with the Soviet Union in a race to build an effective fleet of transcontinental ballistic missiles, in the early 1960s the U.S. government decided to stop the program and refocus all of its research efforts on intercontinental ballistic missile technology. Then, under the leadership of its director Alvin M. Weinberg, the Oak Ridge Laboratory pursued the concept for civilian applications with the construction of a 7.4-MWth MSR, which operated for five years before being permanently shutdown in 1969 (Figure 3). The reason testing was stopped was mainly political, as the MSR experiment in Oak Ridge wasn’t providing enough workload to other laboratories, while at the same time research on fast-breeding reactors was ramping up, requiring the engagement of more and more resources. It was not only political, however. While the MSR concept is quite simple on paper, its industrialization is quite complex. Because the coolant is a mixture of chemicals rather than water, it provokes the release of significant quantities of tritium, which must be removed continuously. 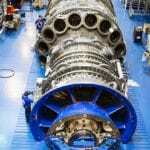 It generates other issues too, such as speedy corrosion of standard alloys, and also core lifetime issues when the coolant is moderated with graphite. Because no MSRs have operated after the early 1970s, none of the technical solutions currently proposed to solve the outstanding issues have actually been tested. Still, new MSR projects are suddenly popping up for two main reasons: the Fukushima events and re-emerging military needs. Addressing Fukushima Concerns. Fukushima demonstrated that when a light water reactor loses all means of residual heat removal from a core in hot shutdown conditions, the melted fuel rods will provoke an important release of hydrogen into the pressurized vessel, resulting in steam explosions and radioactive releases to the environment when the last barrier—the containment structure—is itself deficient. As for MSR, the molten-salt coolant operates at atmospheric pressure with still significant margins until boiling, meaning almost no risk of high-energy steam releases while making easier the use of natural circulation systems (passive means) to remove the residual heat. Furthermore, in case of a leak, the coolant will immediately freeze when meeting with ambient air temperatures. Also, the MSR coolant can’t form burnable hydrogen in case of uncontrolled temperature increase. There are two main types of MSRs: one in which the fuel is in the form of solid pellets like in a PWR and one in which the fuel itself is also dissolved in the salt mixture (liquid-fuel MSRs). The use of a liquid fuel allows the possibility of processing the fuel for purification or withdrawal while online, both in normal or accident situations. A liquid fuel enables, for example, the continuous removal of xenon, which is a fission product that was one of the main causes of the Chernobyl accident. The Fukushima accident acted also as a trigger for renewed public concern regarding nuclear waste production and for a strengthened willingness to increase the renewable portion of the energy mix. In these two domains, the promoters of MSR technology aim to bring answers, as the design can burn the long-lead-time high-activity wastes—the actinides—during operation. Also, as liquid MSRs can continuously remove the xenon from the primary circuit, it enables excellent load-following capabilities to compensate for the intermittence of renewables. Nuclear Power in the New Weapons Race. MSRs have also gotten renewed interest following significant evolutions in military affairs. Indeed, since 2010, the U.S. military has started to deploy effective defense systems against ballistic missiles. In turn, it encourages rival powers to develop alternatives for their deterrence such as extreme-range hypersonic vehicles and low-altitude supersonic missiles. During a speech to the nation on March 1, 2018, President Vladimir Putin revealed to the world the Russian ambition of extreme endurance. “We’ve started the development of new types of strategic weapons that do not use ballistic flight paths on the way to the target,” he said. “One of them is creation of a small-size highly powerful nuclear power plant that can be planted inside the hull of a cruise missile identical to our air-launched X-101 or the United States’ Tomahawk, but at the same time is capable of guaranteeing a flight range that is dozens of times greater, which is practically unlimited,” Putin added. Beyond postures and statements, however, it seems there is still some work to be done. It has been reported that all flight tests of this new cruise missile resulted in short-term crashes. Also, since the emergence of China as a military power, the probability of a high-intensity conflict in the Asia-Pacific region is growing. In such a case, the control over the vastness of the Pacific Ocean will be the aim of each party. Extreme ranges and endurance would be a key advantage for a potential winner. If a nation wants an unlimited power supply for cutting-edge military technologies, then the MSR is indeed a very good candidate. As previously explained, the high temperature generated by an MSR makes it well-suited for airborne operations, while much more compact than a PWR for other applications. The advent of unmanned vehicles also makes the use of MSR technology easier, because radiation shielding requirements become far less stringent with no crew. To counter the threat of new hypersonic vehicles currently under development, armies are again launching research for directed-energy weapons, such as high-energy lasers, which require huge power supplies to run efficiently. Finally, small modular reactors fitted with MSR technology could effectively supply electricity at remote military bases. 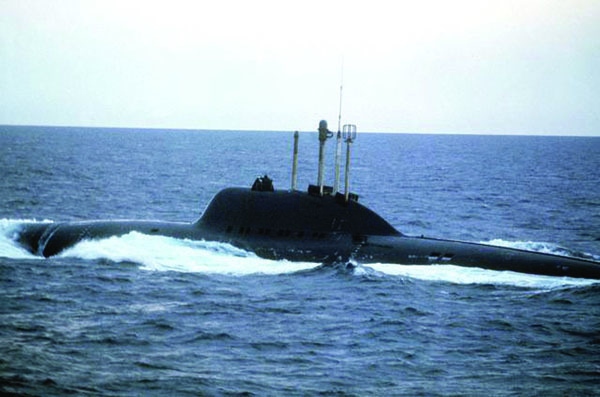 Although these military applications may sound like science fiction, one past example demonstrates the definitive military advantage procured by a high-temperature reactor over a PWR: the development of Alfa class submarines (Figure 4) in the Soviet Union in the 1960s. The Alfa-class submarine is still today considered the fastest, deepest, and most-agile nuclear submarine ever built. Its deployment resulted in the urgent design and manufacture of faster NATO torpedoes, like the U.S. Mark 48 Advanced Capability (ADCAP) or British Spearfish, to counter something that was virtually invulnerable when first put in service. What made the Alfa possible? 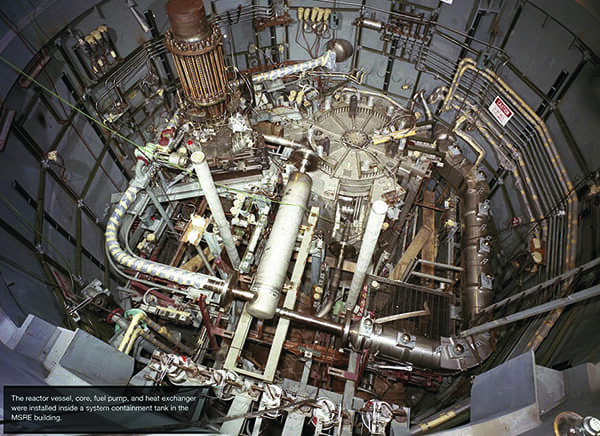 A lead-bismuth-cooled fast reactor, which shares the same main feature of the MSR: high temperature delivery, resulting in a high-power-density design, enabling a small, light, and powerful reactor for the submarine. However, as at ambient temperature the high-density lead-bismuth would freeze, the quayside maintenance operations aimed at preventing any irremediable core damage due to coolant freezing were very complicated and costly. 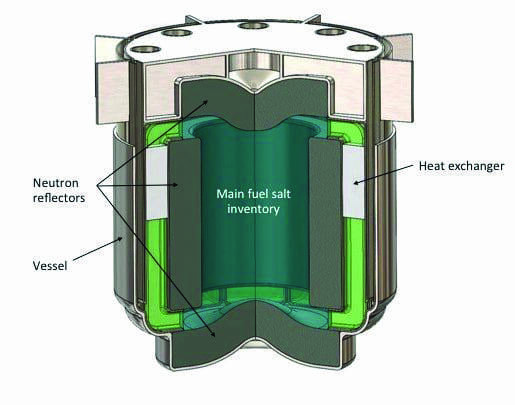 While lead-bismuth and molten-salt reactors share many common points, MSRs are less costly and more easily maintainable. In France, the energy sector has not shown interest in MSR technology, as its current PWR fleet delivers competitive energy while achieving a very high level of safety. Furthermore, new PWR designs (EPRs) are intrinsically much safer than the Fukushima GE Mark I, which was designed in the 1960s. MSRs are not just a different design, however; they are a different sector. 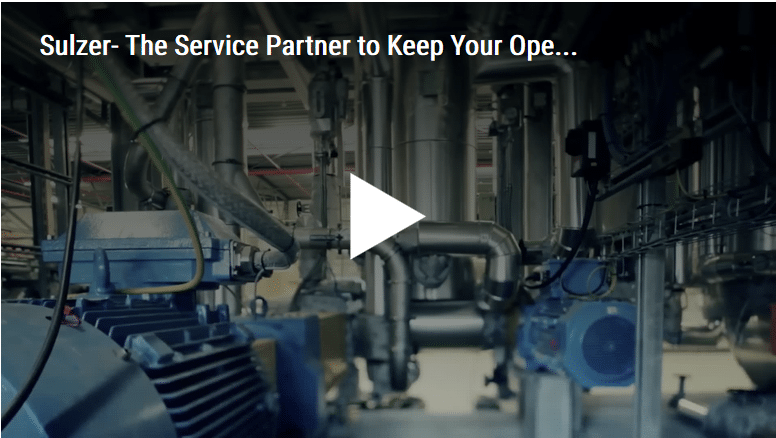 MSR developers must essentially start from scratch with dedicated codes and regulations, dedicated licensing processes, dedicated fuel production facilities, dedicated reactors with dedicated highly trained operators, and dedicated waste reprocessing plants. Nonetheless, the decision to pursue MSRs may not be based on market laws. For MSRs to succeed, they will likely be developed with appropriate political support and military funding. —Jean-Baptiste Peu-Duvallon is a French nuclear energy professional with nearly 15 years of experience on several major construction projects.